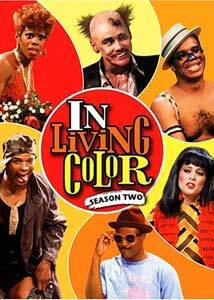 At one point during in its four-year run beginning in 1990, In Living Color seemed guaranteed employment for anyone with the last name Wayans, as Keenan Ivory, Damon, Kim, and Shawn all had steady gigs here. It was the Fox network's fairly successful half-hour stab at urbanizing television sketch comedy, featuring a distinctly street feel to themes and overall approach, from its hip trendy music to the dancing Fly Girls to a noticeably harsher, more outrageous brand of humor. Whereas shows like Saturday Night Live had 90 minutes to fill each week, Wayans and company had a scant 20 minutes, and subsequently the skits moved quickly, averaging five or six per show. This four-disc boxed set contains all 26 episodes from the 1990-1991 run, and the pushing of the comedic boundaries and envelopes was even more pronounced in this second season. The huge writing staff on In Living Color appeared to like living out near the edge of safety, and bizarre characters like the Head Detective, Homey The Clown, HandiMan, and Fire Marshal Bill really came into prominence. For a primetime show (albeit on Fox), there was quite a bit of "out there" comedy, and Fox was either amazingly confident or daringly bold. This was seemingly a show made to fill a societal gap left by the perceived "whiteness" of the long-running SNL, but the Wayans (specifically Damon and Keenan) kept the tilt of the writing at such an wild angle that even though indirectly represented as a "black" sketch comedy series, the humor was so thanklessly irreverent that it immediately appealed to anyone looking for comedy that dared to move into politically incorrect waters. Characters like HandiMan (the handicapped superhero) was indicative of the type of almost subversive sketch writing that dared the viewer to laugh at something that by all rights shouldn't be funny. In Living Color featured Jim Carrey (billed here as James Carrey) as a regular, and it is pretty safe to say he has eclipsed the earthly bounds of sketch television, and calling him the breakout of this series is something of an understatement. As he would do on the big screen, Carrey's rubber-faced flamboyance and cartoonish mannerisms made recurring characters like a hideously burned fire captain or a Middle Eastern rock star exercises into the kind of over-the-top set pieces that almost had him stealing the show out from under the Wayans, David Alan Grier, and Tommy Davidson. Some of the material doesn't work so well (Kelly Coffield's Andrea Dice Clay character or the dreaded Fly Girls, for example), and the show's reliance of reusing and falling back on many of the same characters over and over can either be viewed as just giving the people what they want or hitting the wall creatively. In 26 episodes, there are more laughs than not, and the chance to look back and consistently funny people like Carrey, Damon Wayans, and Grier on a regular basis made In Living Color easily worth a half-hour of my time a week. Image Transfer Review: All episodes are presented in their original 1.33:1 aspect ratio. There is somewhat of an improvement on this set when compared to the softness of the season one release, and the transfers here sport nicely rendered colors. The intro dance sequences have some fine grain, but the sketches look fine. Audio Transfer Review: Audio is provided in very basic 2.0 stereo, offering little in the way of any aural glitz other than delivering easily understood dialogue. Extras Review: Writers Kim Bass and Buddy Sheffield provide optional commentaries for 21 selected sketches here, and while it might initially seem a little strange to only have comments for a portion of a given episode, in hindsight it is a good idea because who really wants or needs a full-length commentary for a sketch comedy show? Not me, that's who. Bass and Sheffield are interesting enough, and considering they don't have much time to talk at any one time the chance for boring downtime in kept to a minimum. Disc 4 contains Season 2 Overview (37m:22s), a fine look back at the show, featuring all the principal writers commenting on the series, in between clips from the show. Appreciating In Living Color (11m:42s) and Notorious ILC: Characters (10m:54s) are a couple of fluffy addendums, featuring more happy talk remembrances of the cast and characters. Each episode is cut into 6 chapters, with optional subtitles in English or Spanish. Comedy should indeed be dangerous, and In Living Color lived and died by that credo. Maybe a bit too urban for mainstream America, this second season set continues with even more of the same demented humor from one of the most underrated sketch comedy shows of the past 20 years. It doesn't always gel, but when it does it is wicked.